The prospect of selling history on e-Bay can't fully explain our fascination for detritus. We seem wired to search for buried treasure, as if ancient, ancestral memories urge us to pull things from the soil; we dig, scrape and tunnel after forgotten fragments of human history. Happily, New Jersey offers a vast repository of ancient treasure. Beginning with the arrival of paleo-Indians, humans have hunted, gathered, plowed, mined and built across New Jersey for thousands of years. Lost to dirt and time, most artifacts remain hidden until pushed to the surface by floods, construction, or farming. Archaeologists dream of such moments: the sudden appearance of projectile points, colonial glassware, Civil War buttons. Enough clues might prompt an investigation, or a "dig". Soil will be removed, inch-by-inch, as they delve into the mysteries of Who, When, How. For the public, a wide range of courses and activities have offered opportunity to understand a science that studies relics to interpret vanished societies. The Lenape Meadow Excavation at Lord Stirling Park, sponsored by the Somerset County Park Commission, sought elusive clues to a people whose only record lies deep in dirt. Scouts and school classes visit the site, and volunteers did much of the work. Two hundred years of agriculture have obliterated most clues to Indian occupation, but to the trained eye the meadow holds potential clues to the lives of paleo-Indians. 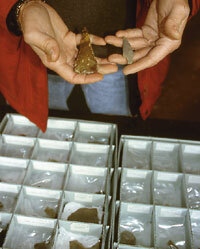 Objects from the Lenape Meadow include flint and quartz chips, shards of Early Woodland pottery, and tools and projectile points from the Late Archaic, Early Woodland, and Late Woodland periods (c. 6,000 to 650 years ago). The natives took advantage of the resources in an area that was once more heavily forested, but with an animal and plant population much as it is today - deer, fox, muskrat, skunk, etc. The natives cooked game in firepits, leaving layers of charred earth behind. Volunteers scraped trowels along packed earth working well below the plow zone and the level that sometimes reveals 18th century ceramics and fragments of colonial pipes. Due to the characteristics of the swamp, there are no organic remains; no one expected to find bone. Even without cadavers, it is not elegant work. An adjacent pit had proven more exciting where the team discovered a hearth and flint knife from the Late Archaic period. Brian Sniatkowski of Minnola scraped dirt off the dark stains of hearth dating back thousands of years. A ring of rock, resembling a mini-Stonehenge, jutted from the still-charred ground where a family, clad in skins, once clustered together for warmth and food in an ancient forest. 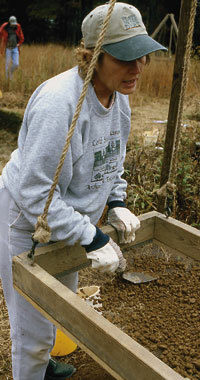 By late fall, the work moved indoors, where the finds were cleaned and catalogued. It is the task of years, the typical effort of small, dedicated teams supported by county, community, and corporate assistance. The work at Lenape Meadow stands in striking contrast to the events that recently unfolded on the New Jersey side of the Delaware Water Gap National Recreation Area. The discovery of endangered flora and fauna forced a beach closure in the park. Forced to find another beach, the Park Service studied shorelines along the Delaware River. Downstream, where the river bottom seemed suitable, Bruce Bevan of Geosight (formerly of Pitman NJ) checked soil compaction with a ground-testing radar system. An object 3.5 meters underground caused a shift in radar signals. Preliminary shovel probes revealed signs of a center post. Soon after, ancient net sinkers, a storage pit and pottery that contained burned corn, beans, and nuts saw the light of day for the first time in hundreds of years. 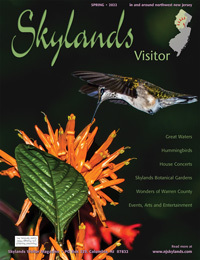 "Everything really started the end of May," recalls Lori Rohrer, an Archaeologist with the Delaware Water Gap NRA. "It was phenomenal. It was the kind of stuff you really don't find. You just get lucky." Lucky indeed. Archaeologists had uncovered a Late Woodland site, an 800-year-old village of five structures. The discovery led to the largest excavation in the Delaware Water Gap, funded by The National Park Service. The find overturned old assumptions of a nomadic, native Indian population. "It seems logical now. People will live in villages. They like the social interaction. This was probably an extended family who lived and fished by the river for three seasons," John R. Wright, Cultural Resources Archeologist of DWGNRA, speculates. The genius of archaeology lies in cultural interpretations drawn from fragile, scattered clues in the earth. The village offers a tantalizing glimpse of the day-to-day life of Late Woodland Indians, the probable ancestors to the Delaware Indians. The Park Service uncovered hundreds of artifacts: hammer stones to knock off flint at a quarry, and an adze to carve canoes from tree trunks. Stain from post molds revealed the placement of a fence, prompting questions as to its purpose. Tests on the materials and subsequent interpretations will no doubt mirror those done on a Late Woodland clay pot, discovered earlier at the Delaware Water Gap NRA. The crosshatched pattern around the rim baffled archaeologists, who worked through various possible explanations. "The decorations were made with porcupine quills," John Wright explains. "We know that from microscopic evidence, and tests with materials." 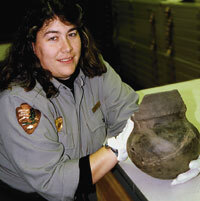 Some of the artifacts will go to native groups, and the collection should be available for viewing by next summer. Park employees were relieved to complete the dig, well aware that looters might find the site irresistible. "The very nature of archaeology destroys things, but we reestablish the site in the lab," John Wright explains. "When things are stolen, someone has destroyed history. All chance of learning is lost when the object is taken out of context." Context is key. Accurately recreating a long-gone era is the bedrock of living history. In Stanhope, at the Lenni Lenape Village in Waterloo Village, (currently closed) archaeologist John Kraft used information gleaned from years of work to recreate the tragic, final phase in the Lenape's history. A tangible culmination of an archaeological project, staged scenes in the village depict Indians negotiating with Dutch traders, and a child suffering from smallpox. As the next wave of human occupation pushed the Indians out, those same traders and early colonials left their own artifacts behind. In Alexandria Township, a building project unearthed Hessian gravesites. In North Branch, when homeowners raised their homes to prevent a recurrence of the damage caused by Hurricane Floyd in 1999, an archaeologist working for an architectural firm discovered a cache of colonial artifacts under a house's foundation. The former privy was a bountiful source of prized artifacts during the excavation at Lord Stirling’s Manor. 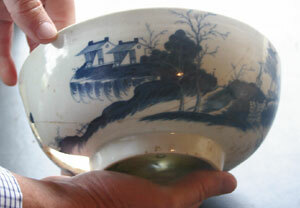 The reassembled porcelain “precipice” bowl shown above could have been brought from England by Stirling himself. 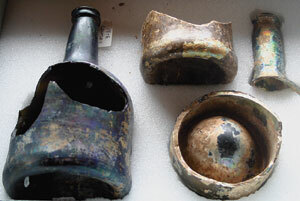 The pieces of brandy bottles below were also among the hundreds of discarded items discovered from the Colonial household. For those who don't want to rely on serendipity, an annual 1770s Festival at the SCEEC in October offers a chance to appreciate colonial society. Items gleaned over the course of a public archaeological project sponsored by the SCEEC and conducted by Dr. Cooper are displayed at the 18th century manor house of Lord Stirling, a Major General during the American Revolution. 80,000 pieces, representing more than 230 years of occupation, were discovered over the course of the project (which ended in 1991). Living historians demonstrate the use of many tools, making such items as rifles, redware pottery, powder horns, and clay items with Stirling clay. Beginning with the same timeframe in New Jersey's history, an interest in the early era of mines and mining communities has prompted some archaeologists and historians to study New Jersey's abandoned mines. Iron works in the Highlands area supplied ore for at least three wars, starting with the American Revolution. At Ringwood Manor in Ringwood State Park, visitors can learn about an iron community's development through the Colonial, Federal and Victorian periods. Founded in 1766 and operational until 1882, Long Pond Ironworks, an integral part of Ringwood Manor, still exists, in part. The ruins of three furnaces can be found in Lond Pond Ironworks State Park in West Milford. A fascination for the men who carted materials from deep inside the earth pulls the curious to odd features in New Jersey's hills. Just north of Route 80, the Mount Hope Mine, begun in the early 1700s, is possibly one of the oldest mines in the United States, a remnant of the quest for widely demanded iron ore. The Mount Hope Mine, along with the Hibernia Mine, provided shot and ordnance for the Continental Army during the American Revolution. The Mount Hope Mine would yield close to 6,000,000 tons of iron ore. The bone-chilling depths of its New Leonard shaft reached almost 2,700 feet. Ultimately, the mines were abandoned, leaving rubble-strewn holes and deep shafts behind. Most have been sealed. The main entrance to the Hibernia Mine has been closed and preserved as a bat hibernaculum. Armchair archaeologists and historians can visit Abandoned Mines of the Highlands for a sense of the scope and range of New Jersey's mines. A member of the North Jersey Highlands Historical Society, Mike Hetman hopes to simultaneously educate the public and preserve the old mining sites. The curious can submit questions to his on-line forum. According to his website, Mr. Hetman occasionally gives private tours of some of these sites and provides insight regarding their history and stories of the past. More contemporary puzzles challenge forensic archaeologists who shift through debris for clues to crimes that are often environmental. The work is not for the fainthearted. In 1998, odd things, unearthed by erosion, popped up at a Superfund site in Sussex County along the banks of the Delaware River. The odd things turned out to be unexploded WWII ordinance: phosphorous based flares, chemicals used in manganese hand grenades. "It was volatile stuff," says John Wright. "It got turned over to the Explosive Ordinance Detail. It took thirty to forty-five days to expose it all." The mystery of human history tugs at our imagination. In that spirit, I decided to conduct my own mini-dig. Of all possible shocks, I was most afraid of uncovering buried electrical lines. According to the state, shallow digs around 6 inches deep would exempt me from permit requirements. I gave in to the lure of dirt, earth, and mystery and reverted to the urge of our ape ancestors­in a modern tech way. With a friend, I struck out across a farm where a plow had uncovered immense, century old hand-forged horseshoes. Swinging a big, handheld metal detector over the ground, we navigated cow patties and picked our way through a field of alfalfa. We tried to coax secrets from the earth. Only half in jest, we laughed at a fantasy of uncovering George Washington's sword. The needle swung. Bleeping noises came from the metal detector. Grabbing shovels, we scooped out the topsoil, to discover ore in buried rocks. Twenty minutes later, we abandoned the rock-strewn field and headed for a stream by the wreck of a 19th century kiln. The metal detector clicked and bleeped over a discarded feed bin cover. We kicked leaves around. Eventually we discovered a small narrow pipe, shards of broken glass and a model horse encased in a clear plastic box. A milk bottle, surprisingly intact, perhaps fifty years old. And lots of ore-laced rock. A woman stood in her driveway, watching us work. This hunt for debris was perhaps best left to professionals. Nonetheless, we searched the woods and paths of the farm. The interest was not without its irony: we dug in the dirt to find out why people dug in the dirt. But this search for clues to our past was satisfying in a way an evening watching Clan of the Cave Bear could never be. I moved on to the ruined foundation of an 18th century farmhouse. Just for fun.